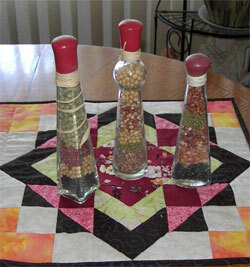 These dried bean bottles are a very quick and simple project to make. You can use recycled jars and bottles that you have or you can get them at thrift stores. For this dried bean bottle craft project all you need are bottles and beans. Dried beans can be bought at your local supermarket. You can use different colored beans, dried peas, popcorn and different lentils. Try to get different colors so that there will be a distinction between the layers. Start by layering the beans in various colors to the top of the jar. Lightly tap to settle down the beans. Keep adding more beans till it is full. For a jar without a lid, cut a piece of cotton wadding to fit into the jar and put a pretty piece of fabric over to finish it off. I use raffia to tie around the lid. If you are using a decorative bottle with a nice lid just glue the lid closed and forget about the fabric. Melt some wax and dip the top of the bottle in it. This seals it as well as makes it look more decorative. You can also use raffia under the lid to give it a country look. They are very easy to make and make great gifts. Kids can make them for parents, grandparents or teacher gifts.